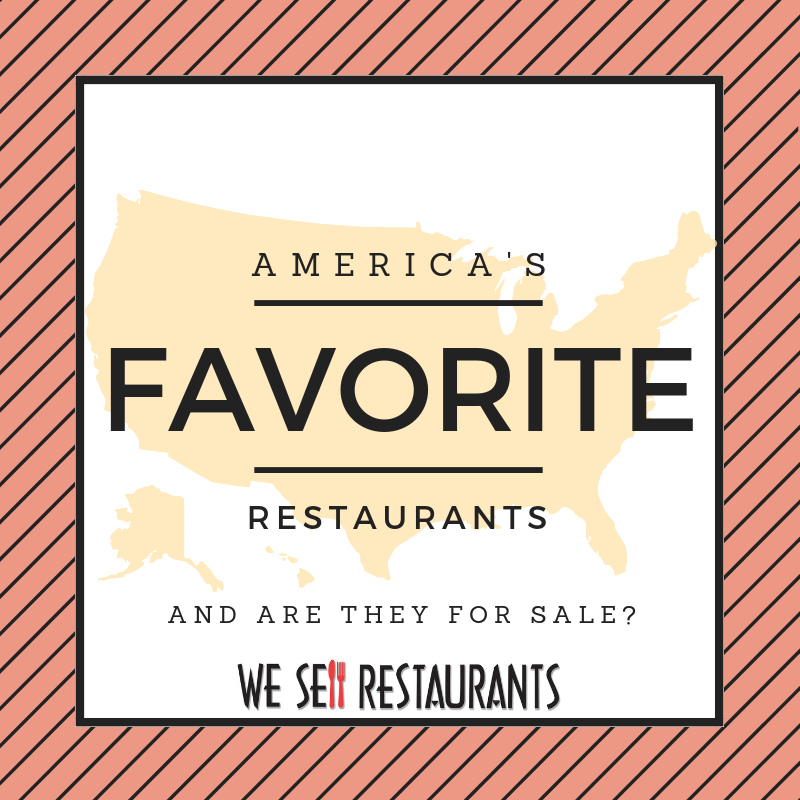 What are America's Favorite Restaurants and are they for Sale? What are America's favorite restaurants and are any of them for sale? Here are the answers since the latest list has been compiled according to an annual study by the Harris Poll. The Harris Poll's EquiTrend study monitors thousands of brands. In this year's study more than 77,000 United States based consumers participated. They rated more than 3,000 brands across 300 categories, and 80 brands were named "Brand of the Year." Some results are expected and duplicate last year. Other results are pretty surprising! If these are America's favorites, is there a chance to get your hands on one of your own? You bet. The great news is that We Sell Restaurants has some of these very restaurants for sale in in our inventory. Here are the results by category along with our thoughts on those taking the top spot, or surprisingly enough, not winning "best of" by this poll. For the Mexican category, Taco Bell knocked last year's winner, Moe's from the top spot to regain the position they previously held as the number one Mexican favorite. Among our restaurants for sale, we do not include a Taco Bell but we have strong interest at We Sell Restaurants for virtually anything in this category ranging from fast casual Mexican like Moe's to full service dining. Check out this current favorite among our Mexican restaurants for sale. Our restaurants for sale in this category range from franchise opportunities to independents. In the mood for the classic American Burger? Five Guys took the top position in this poll. From our restaurants for sale inventory, this burger chain opportunity tops the list at our website. While the burger chains focus on the fast food to fast casual style of service, casual dining is a favorite of many consumers. In that category, the Hollis Poll surfaced a tie. The top spot was split between The Cheesecake Factory and Texas Roadhouse. Who doesn't love the opportunity to shuck their own peanuts at Texas Roadhouse? When it comes to chicken, the favorite is no surprise. This chain manages to deliver the top average unit volume nationwide combined with incredible customer service. Chick-Fil-A took top honors and this is a multi-year achievement for the brand. If sweet is your passion, Krispy Kreme led the list in the coffee shop category. This one is actually surprising for those of us selling restaurants for a living. Because the category is coffee shop, we would have expected to see Starbucks take top honors. Instead, they were knocked off by those who are serving the doughnuts and coffee hot at their locations. In the ice cream category, Ben & Jerry's took top honors. Their eclectic mix of flavors even at premium price points had them leading the way. In our restaurants for sale inventory, we feature a great opportunity to acquire a Ben & Jerry's delivering six figure income. Here's a link to that business opportunity in Florida. America's favorite pizza chain according to the Harris Poll is Blaze Pizza. Now this was a surprise as Blaze doesn't have the footprint of many other chains. Considering that they have only 286 stores nationwide, we are actually pretty shocked by this result. For sandwich shops, there was again, a tie for the top position. Panera Bread and Subway tied for first place in the sandwich shop category. We have a number of Subway franchises for sale at this link and sandwich shops lead our inventory in store counts and interest by buyers. Since these are easily operated, well trained by the brands and for the most part, avoid alcohol, late nights and even frying, they are among our most popular restaurants for sale. Did the Harris Poll cover your favorites or leave something out? Send us your comments on this article.